Sandwich And Panini Maker Just $9.99! Down From $20! You are here: Home / Great Deals / Amazon Deals / Sandwich And Panini Maker Just $9.99! Down From $20! At Amazon, you can score this Sandwich And Panini Maker for just $9.99 down from $19.99! Please note that this is an add-on item and will ship with a qualifying order of $25! Not all of us have mastered the art of perfectly flipping a sandwich in a frying pan. And that’s okay. 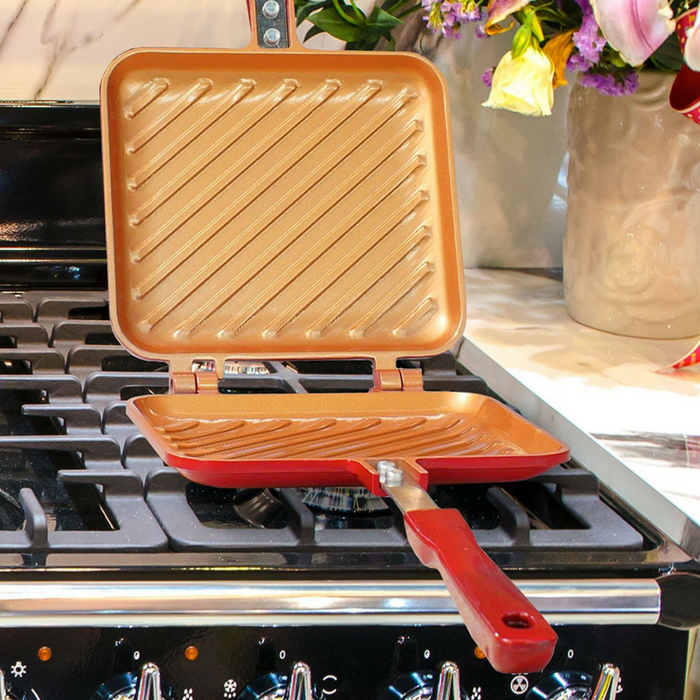 Red Copper Flipwich makes flipping and grilling sandwiches on your stovetop fun and easy. Flip with confidence when you use Flipwich. In a single step, you can create gooey grilled cheese, press the perfect panini, or efficiently grill a chicken cutlet to top your salad. Start your Red Copper collection with the 10-piece or 5-piece set, or build slowly by adding from the wide range of pots and pans, bakeware, and specialty cookware, like the 5 Minute Chef and Flipwich.